Kanako Watanabe and Kaoru Kimura at the Sakae Mura table. 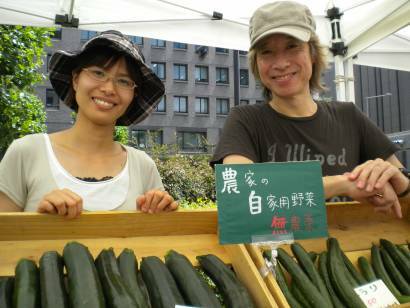 The farmers market at the United Nations University is easily one of the biggest affairs of its kind in Tokyo. A two-day extravaganza of food, food products, and a few other miscellaneous items it could be likened to a miniature festival celebrating Japan's food traditions that just happens to take place every weekend. (This coming weekend, by the way, is the monthly night market. A unique innovation in terms of farmers markets, it promises cool evening breezes, good food and good food shopping, along with a little music. I'd recommend planning an outing now, in fact.) Each time I go I meet farmers growing good things and doing good work from all over. It's terribly inspiring and satisfying. This past weekend, though, found me searching out one particular booth. Kevin and Tomoe, our friends over at One Life Japan, mentioned their village sponsored a table there where Tomoe's most yummy bread would be for sale. I was on the train in seconds flat. Here's the story of what I found. Once a month Kanako Watanabe heaves boxes of fresh vegetables, rice, homemade bread, tomato juice, and whatever else Sakae Mura, the village in Nagano Prefecture that she now calls home, can offer up into her vehicle and begins the four-hour drive to Tokyo. Mountains and fields roll by as buildings slowly get taller and the space between them gets ever smaller. She arrives at the United Nations Farmers Market around 9am to start setting up her table. Joined by a friend or two, she'll restock the table, chat with visitors, and (hopefully) drive back with mostly empty containers for company at the end of the day. Employed by Sakae Village Network, a relatively new and innovative NPO, Watanabe's monthly visits to Tokyo are part of Sakae Mura's larger vision for itself. Created only a handful of hears ago, the NPO strives to find and foster sustainable development ideas that will create economic opportunity for those currently living in the village. Set in a small valley surrounded by mountains with a river tumbling along the center, the village boasts tremendous scenery, plenty of hiking, sansai, and more than a few monkeys. Most of its residents are farmers, and can be seen out working in their fields at any time of year. 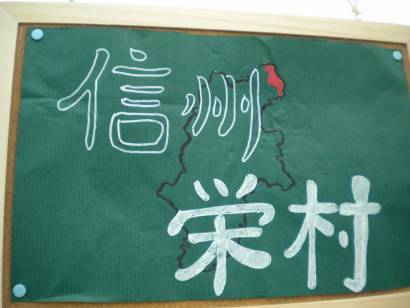 The NPO also hopes to attract new people to the village where 70 is the average age. By promoting economic opportunity and show-casing themselves in larger venues, the village hopes to catch the eye of people looking to get out of the city, to try their hand at something new. 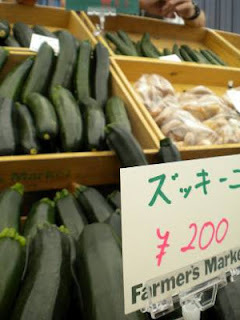 Buy some zucchini (beautifully shaped and dark green, by the way), a loaf of organic bread (made using organic whole-grain brown rice), and next thing you know you're moving out of hot and stuffy Tokyo to a quiet village in the mountains of Nagano to try your hand at farming and developing a killer jam recipe. Sounds reasonable to me, but then I'm a geek like that. Meanwhile, head on down to the UNU Farmers Market in August (watch for the schedule here!) and ask at the information booth for the Sakae Mura table. You'll find reasonably priced vegetables, rice and other nifty things, and who knows? Maybe next time you read this blog it will be from a little village where monkeys pester, terraced rice fields dominate the landscape, and the snow will be up to your roof!